Legal arguments this morning revolved around the State's intent to call Ginny Brown, mother of the late Kirby Brown, as a witness. Victim testimony has been excluded from this case in an earlier ruling -- one Kelly described as "well-written," in a moment of transparent sycophancy. But there are a handful of exceptions Sheila Polk invoked in her argument to allow Mrs. Brown to testify. Brown was in town and available this week observing the trial. Much of it revolved around getting her to verify signatures on documents that the prosecutors want to get into evidence. Ultimately, they did not call her, and in listening to argument throughout the day, I tend to think that those signatures were the primary issue, and the State was able to get the defense to stipulate to some of them. Much of it revolves around money and the fact that a lot of the prejudicial information about JRI's sales practices has been excluded. One thing brought out in legal arguments this morning that the jury will definitely not hear, is that Ginny Brown is suing James Ray to recover Kirby Brown's prepayment for the canceled Quantum Leap conference. I posted on this issue some time ago. James Ray never refunded the prepayments for events that were canceled after the sweat lodge fiasco. He even put out this comical statement regarding the issue of these "investments." A lot of self-help personalities describe payment for events as investments, the idea being that you are investing in yourself and your future. In James Ray's case, I guess it's more like investing in a risky stock. You could win big, or you could lose it all… including your life, it would seem. Later, Ray offered a series of teleconferences to people who were willing to drop their law suits and stop trying to get their money back. Keeping payments for services never delivered is absurdly bad business practice but withholding those funds from a dead woman's family is beyond the pale. How exactly is Kirby Brown supposed to collect on her "investment" even conceptually. Where's her teleconference? Valhalla? In looking at the defense table this morning, it occurred to me that it looked to be a little light. Conspicuous by her absence was Truc Do. My first thought, obviously, was that she was too humiliated over her disastrous cross examination of Dr. Dickson to face the courtroom today. But, frankly, I hate to think that her ego is that fragile. When I pointed this out to my husband he told me he would have been surprised if she had shown up. He had fully expected her to be off licking her wounds somewhere. For all I know Truc Do is legitimately ill. Even so, I have to say that were it me, unless I was completely incapable of functioning, I would have forced my aching limbs into some pantyhose and made my way to court. Not showing up after taking a pasting like that looks worse than that pasting. I'm left wondering how many ways she can compound a problem. For someone so obviously terrified of ever showing weakness, it seems strange to me that she would make herself look weaker still by not showing up in court. 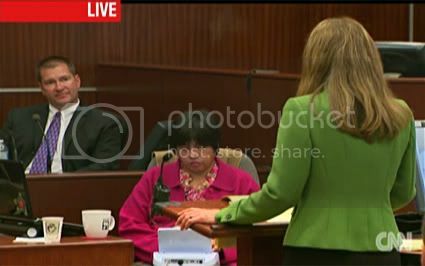 Do got clobbered by Dr. Dickson because she put foolish pride above everything, including the defense's case. She couldn't let go of the small stuff. Ultimately, she sacrificed a knight, both bishops, and the queen, to protect her pawns. She was visibly shaken yesterday and not showing up today sends the message that she's even more upset than she appeared. I can't help wondering if her upset is over a poor strategy that actually enabled the good doctor in his destruction of her organophosphate poisoning theory. Is she even aware of that? Or is she upset that she failed to get the witness to concede some of these small but useful points she's so fond of racking up on her somewhat mysterious, internal checklist. From what I've observed in her courtroom performance, I'd be seriously concerned that it's the latter. That would make this entirely about ego. I'm sure Do would say I'm just "Monday quarterbacking" but that, for what it's worth, is my opinion. Luis Li completed his cross examination of Sgt. Barbaro today without managing to discredit what is arguably the most damaging testimony yet. As I said yesterday, what Sgt. Barbaro revealed was Ray's consciousness of guilt. 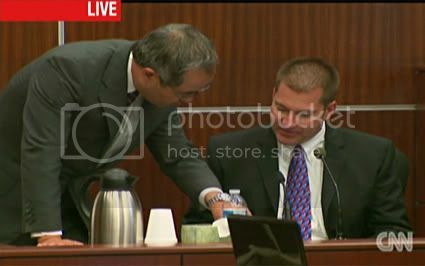 Li did about the only thing a defense attorney could do in his situation; try to prove that this extremely likable police officer was mistaken. This is clearly why Li spent so much time trying to underscore Barbaro's imperfect recollection of who was receiving CPR and where. Personally, I think he wasted a lot of energy on a point that Barbaro conceded without issue. Sgt. Barbaro conveyed quite well that this was not an essential issue that required his full attention. He's not claiming a photographic memory of the scene. What Sgt. Barbaro testified to regarding Ray's assertion that there were 40 people in the sweat lodge and that it was run by Ted Mercer, was the result of a police interview, not an observation of the overall scene. Taking witness and suspect testimony is a major part of his job. It's something he's had both on the job and special training in. These are things he documented in his report; not just recollections of numerous things he observed in the midst of a very chaotic scene. Li's strongest points had to do with an equipment failure that caused recorded testimony to be lost and that he misreported the name of James Ray's assistant Josh Fredrickson, taking it down as Jason. I don't know, maybe Li was just trying to demonstrate what confusion is by turning his own questions into one of those muddled wordscapes of which he seems so fond. If so, he failed, because Sgt. Barbaro maintained his clarity about what interviews took place when and where and what was said to whom during his interview with Ray. He was willing to concede that Ray might have been confused. He was quite sure of what was said, however. From there Li moved on to the possibility of toxic exposure. Sgt. Barbaro had ruled out carbon monoxide to his own satisfaction because no one presented as bright red. He had described that air was collected. But he conceded that he really wouldn't know if there were other chemicals present. Fairly irrelevant testimony in this case because he was not involved in the case after that night and would have no idea what results came back. I think Li was trying to establish that it would be procedure to sample blood and soil. 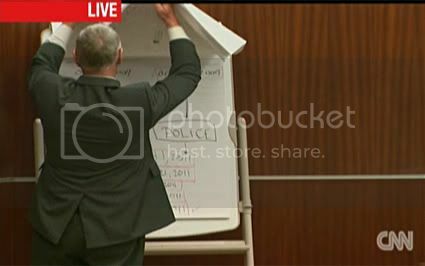 Li compared all of this to samples of chemicals in meth labs. Sgt. Barbaro explained that charges, even of meth dealers, weren't filed based on lab reports but said that those reports would be evaluated when they came back. Obviously Li was trying to make the point that the lab reports in the Ray case were not much considered. Of course, the fact that those lab reports didn't show anything concerning in this case is already clear and will, no doubt, be clearer when criminalist Dawn Sy testifies. Much of Li's cross was about that meandering. He spoke almost entirely in vague generalities and didn't really connect any dots. Whatever points he made were through implication. To his credit, he didn't try to force the Sgt. Barbaro to make full-throated concessions to being "wrong" or even an "outlier." When Sheila Polk started her redirect, she pointed out that Sidney Spencer was in the area where Sgt. Barbaro thought he'd seen a woman receiving CPR. She was intubated and received extensive treatment, if not CPR. So his memory for random detail is not so bad, even amidst chaos. Polk also asked Sgt. Barbaro to clarify the role of lab reports in arrests. He explained that the labs are always backlogged and that they don't arrest based on lab reports. It has more to do with detective work. And as for that Jason person, was it possible he gave Barbaro a false name? "It's possible," said Sgt. Barbaro. Polk also clarified that Sgt. Barbaro's questions were very clear and straightforward. "Where do you live?" "How many people were in the sweat lodge?" The answers were equally clear: Las Vegas and 40. Barbaro did not think there was any confusion between his questions and Lt. Parkinson's, nor the answers they elicited from Ray. Lt. Parkinson wanted to know who was running the event and it was James Ray. Sgt. Barbaro had very clearly asked who was running the sweat lodge itself -- and he has does done sweat lodge ceremony so he has no confusion about what is entailed in that -- and Ray's answer was "Ted." Ray, he said, could have been confused, but he described him as appearing calm and their conversation as "normal." Sgt. Barbaro's entire manner is clear and decisive. He answers questions in brief, succinct terms. He certainly did not come across as a confused or vague person. He's a highly credible witness giving very damning testimony. Sgt. Barbaro was excused subject to recall. The firekeeper's daughter Sara Mercer gave tearful testimony today as she recalled the horror of the deadly sweat lodge scene. As described in her mother Debbie Mercer's testimony, it was Sara who helped her pull the unconscious victims out of the sweat lodge at the end of the ceremony. Sara reiterated a lot of what has been testified to by her mother and by Fawn Foster and she corroborated a lot of those details. There were some new pieces of information that emerged however. She had assisted her mother as doorkeeper and had been by that entrance a good bit of the time. She described having actually seen Lou Caci as he attempted to crawl out of the sweat lodge and she saw him put his arm down into the heated rocks. She described his badly burned arm as "really gross." She saw and heard a lot of what went on inside. 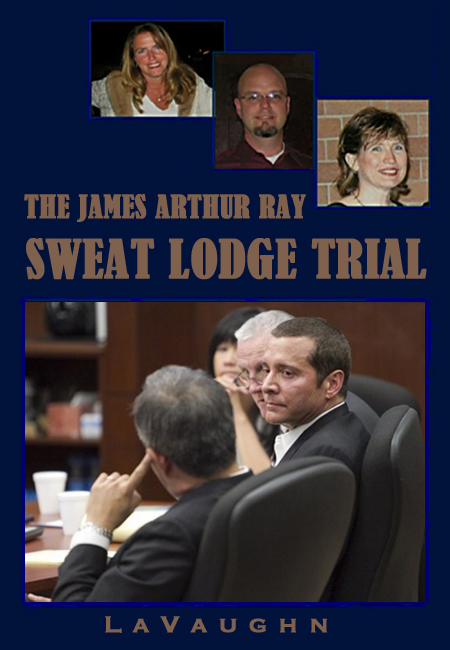 She described James Ray as keeping his head near the door, as close to the door as possible, which she knew vividly because she had periodically stroked his head in an attempt to lend "support." He described her as "beautiful" and an "angel." She seemed to embrace that support role throughout, helping people as the left the lodge throughout the ceremony. No one really just "came out" of the sweat lodge, she said. They had to be helped or dragged. She would help them get to the tarps, hose them down, and give them water to drink. She also helped move the buckets of water and rocks into the sweat lodge and brushed the ashes off the heated rocks. Ray gave people a little bit of "crap" if they tried to leave, she said. He would remind them that this was what they were there for and that they were more than their bodies. Most alarmingly, she heard people expressing concern about unconscious people, and heard Ray say it was "a good thing." She was "confused" that he directed people to leave people there for the last round, but she didn't feel it was her place to do anything about it. Sara broke down completely as described the end of the sweat lodge and finding the three unconscious people inside, including the man and woman holding hands, their faces "all funny colors." She described her father doing starting CPR as the Dream Team nurse asked, "What do I do?" Sara had been directed to take a woman back to her room in a golf cart. The woman's eyes, she noticed, were rolling up in her head. On her way back, she ran into "family friend" Shawna Bowen, who looked at the woman and said she needed to be returned to the scene for medical attention. On the way back, the woman's foot slipped out of the golf cart and even when it was accidentally run over, she didn't react. But Sara was very unclear about who was making decisions to clear people in such obviously bad shape from the scene. Sara Mercer said she'd cried throughout the night, afterward, and she cried throughout her testimony about the aftermath of the sweat lodge. Polk requested a sidebar which went on for about fifteen minutes, and through it all the camera was trained on the pretty, young Sara. She continued to dab at her tearing eyes with a crumpled tissue. She rocked the chair from side to side; a childlike, self-comforting behavior. The sidebar and some ensuing legal discussion had to do with Sheila Polk's plan to ask Sara Mercer about the 2008 sweat lodge, which Judge Darrow decided to allow. Sara did see people in 2008 who were not feeling too well. She described the woman who scraped up her face, when she collapsed into the gravel as she was trying to leave the sweat lodge. She also described a woman who was lying on the ground and shaking violently. She'd heard a man who kept yelling that he didn't want to die. She described people who looked exhausted, throwing up, and with their eyes rolling back in their heads. "There were some that were okay, though, too," she said. Tom Kelly would like to know why Sara Mercer isn't more like a teenager in one of those '50s sitcoms. He finds it strange that a girl who witnessed a horrific tragedy at 17 wouldn't want to talk about all of it with her parents. Because all traumatized kids love to talk about their feelings, especially with adults. Don't they? They also love to watch all the news coverage about those traumatic events and repeatedly re-traumatize themselves. Don't they? Kelly tried to be sympathetic and grandfatherly towards the shaken and teary-eyed Mercer as he addressed her on the witness stand. He tried hard not to look like a creepy, old dude preying on a vulnerable, 19 year old girl. He was only partially successful. Kelly started out chatty and warm, talking to her about her life and her plans. She responded to him openly about her current living situation on a houseboat at the boat rental company where she works. 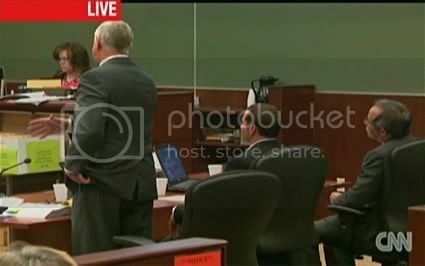 As the cross examination went on, Sara's demeanor changed just a little to that of a sullen, resentful teenager. She remained cooperative but seemed to shut down, answering questions tersely, and a little defensively. She doesn't strike me as a stupid girl and it was probably increasingly obvious to her that Kelly was being manipulative and deceptive. And that he was trying to use her testimony to impugn her parents. Did she she know her father built the sweat lodge and that her mother researched how to do it, he asked, twisting the facts like it was cool. Mostly Kelly prodded Sara about whom she'd spoken to and what television and newspaper coverage of the tragedy she'd taken in. What about the kids at school? They'd had some questions, but she said repeatedly that she just hadn't wanted to talk about it. She'd also moved "back to Wickenburg" and changed schools right after the event. Kelly, of course, wouldn't let any of this go, coming at the same questions from a variety of angles. 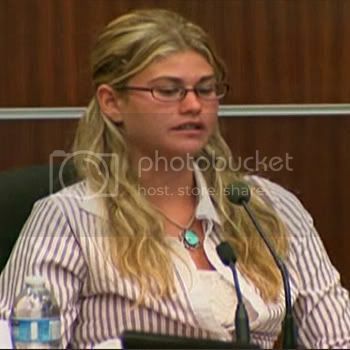 Kelly tried hard to prove that her testimony had been influenced by her family, the media, and Fawn Foster. Why, for instance, did she say in a police interview that she first felt concerned when she described the unconscious, not breathing people? Pretty much the thing that would predominate in anyone's mind after experiencing a trauma like that, I'd think. One interesting detail that popped out during this testimony was that Sara described the pumphouse where the sweat lodge coverings were kept as being full of spider webs. I don't think this had anything to do with any "black widow colony" that Luis Li had been so concerned about… since no such thing exists. But it does make the use of all those mysterious insecticides a lot less likely. Some of those kill spiders but, more to the point, spiders to don't spin webs where there is no food supply. Kelly also had put up photos of that 2008 sweat lodge. You know, the ones with all those shiny, happy people. Those photos really cut both ways. I don't know why the defense keeps dragging those out. But he tried to make his usual points about how nothing so concerning going on there, else why would she have come back in 2009? Surely, she hadn't expected anyone to die. No, she conceded, she had not. Sheila Polk's redirect was pretty straightforward. She asked Sara to describe what her father had done during the ceremony and she explained that tending the fire was really a full time job. Kelly had tried to impugn her parents in a number of subtle ways, including implying that her first responder father should have helped throughout. She did, of course, see her father doing CPR at the end when it was obvious that lives were imperiled. And did Sara see James Ray then? No. No she hadn't. So the underpaid firekeeper tried to save lives. The man who was paid tens of thousands of dollars to be a leader; not so much. It's a point that's made a lot but it's always worth restating it when the defense opens the door like that. Sara also answered more questions about the 2008 event and those lovely photographs of people on the ground. She explained in more detail that there were people who "couldn't make sentences," whose faces were red, and that woman was all tensed up and shaking. And, yes, she did hear someone shouting that he didn't want to die in both years. Sara reiterated that she did not enjoy talking about this event and did not watch or read news about it. "It's my choice to talk about it or not," she said. Sara Mercer was excused subject to recall.